We'd like to meet with you to explain how our products can solve your unique structural issue. To prepare a free foundation repair quote, we inspect your damaged areas, identify the causes, and create a written proposal that outlines all work to be done. 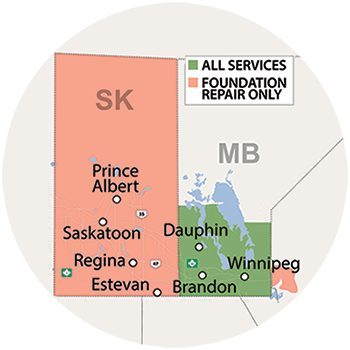 If you live in Greater Winnipeg and would like to schedule your free foundation inspection and quote, call or e-mail us today! At BlueMaxx Basement Systems, we have exclusive access to Supportworks' industry leading structural repair products in our Manitoba service area. We're proud to serve Winnipeg, Brandon, Portage La Prairie, nearby localities such as Selkirk, Dauphin, Steinbach, Thompson, St Andrews, Winkler, Morden, and the surrounding areas.